The Grayscaled Dragon is one of the most feared monster in all of Godville. This creature is powerful enough to demolish entire villages in a day. Heroes that encounter this beast are said to wet their pants three times before actually attacking. The roar of this beast is also said to foretell disaster. Heroes use it to foretell their death. 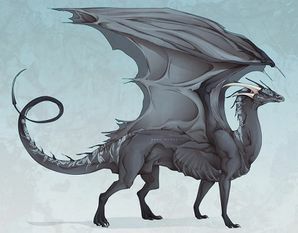 The Grayscaled Dragon is coated in over 50 shades of gray scales. The scales are shiny and metallic-like. It is about 30 feet tall and 50 feet long and an adult weighs 10 tons. It has a muscular build and can carry objects and monsters twice its size as it soars through the air. The scales are harder than steel, but when exposed, the skin is as soft as a baby's bottom. Because of this, dead Dragons make some of the best armor. The dragon's claws are able to slice through any material known to man. However, only they can scratch the surface of another Grayscaled Dragon's hide. Claws make expensive, but powerful swords. Other than that, they look like regular dragons. It can hold its breath for half an hour, so it can hide in a deep ocean. On its left breast it's missing a scale. This has been classified as a genetic mutation. Painting it makes it weaker, as the paint chemicals seep through the scales to the skin, and then to the bloodstream. However, it takes a lot of paint to weaken it significantly, and if you get close enough to paint it you are surely dead. You can easily avoid it hiding in greens, because it's colorblind. This page was last edited on 19 February 2019, at 14:14.